This movie gives an update on the resistance to the Fleet Review which was held October 10-14, 2018, and is particularly directed to the friends around the world who fight against military bases and militarism, especially including those who gathered at the first International Conference against US/NATO Military Bases on November 16-18, at the Liberty Hall in Dublin, Ireland. ___ Hello, friends. We are sending this from Gangjeong Village, Jeju Island, South Korea. Above all, we would like to express our solidarity with the friends around the world who fight against military bases and militarism. We also want to share what is happening in Jeju, the World Peace Island. For more than 11 years so far, we have been fighting against the Jeju navy base. It opened in February 2016. It is a South Korean base but last year, it was visited by 10 international warships including two Australian warships, two Canadian warships, and six United States warships including a US nuclear submarine. And this year, the South Korean navy hosted an international fleet review in the Jeju navy base. The UNESCO-designated Gangjeong Sea and its nearby seas suffered from the effects of about 40 warships including 19 international warships from 13 countries. One of the ships was the US nuclear aircraft carrier Ronald Reagan. Our small but courageous kayak team kept the coast guard busy at the sea entrance of the base, and one news source even claimed they delayed the entry of the USS Ronald Reagan. On the land, people protested the fleet review day and night for two weeks. We think the fleet review was a de facto proclamation of US military intentions for the base. 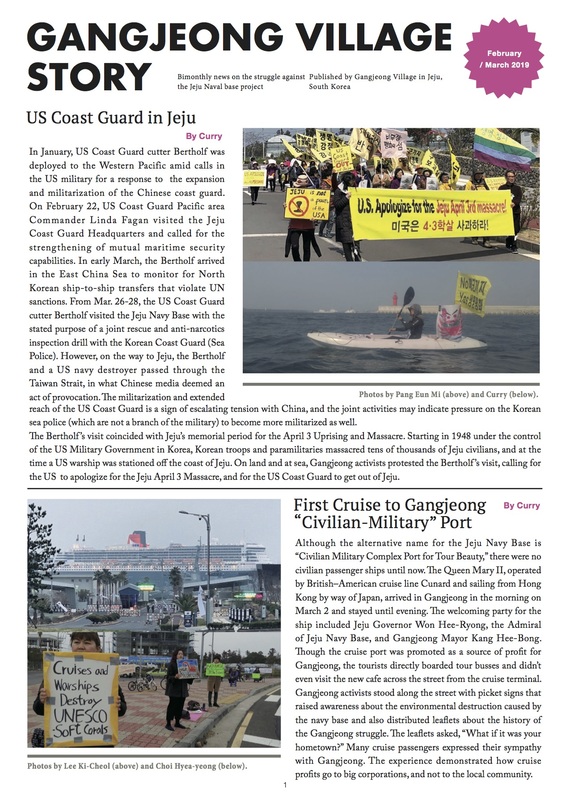 During the fleet review, it also became very clear that the South Korean government covets to have a blue water navy whose job extends ‘beyond Korea.’ Amid increasing military tensions between China and the United States, it is dangerous for Jeju to be militarized as it is located close to China. Further this year marks the 70th year since the April 3rd uprising by the Jeju Islanders and subsequent massacre which was led by the US Army Military Government who then ruled the Island. We demand: 1. Close the Jeju Navy Base 2. Stop the militarization of Jeju, including the 2nd Jeju airport (air force base) project For years we have worked to build solidarity among the islands and regions who fight militarism. We dream of a sea which is a space of peace and coexistence for all life.